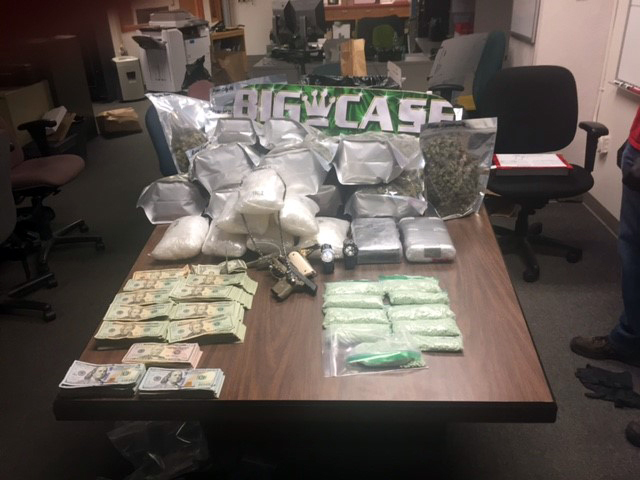 A weeks-long investigation into the activities of a Keizer man yielded a major drug bust for the Salem Police Department’s Street Crimes Unit (SCU) on Thursday, Feb. 16. Members of the SCU, assisted by officers from the Keizer Police Department, acted on three search warrants in Salem and Keizer resulting in the seizure of 40 pounds of marijuana, 17 pounds of methamphetamine, five pounds of cocaine, a quarter-pound of heroin, 10,000 oxycodone pills, $40,000 in cash, five firearms and two sets of body armor. Police arrested 36-year-old Casey Miser, of Keizer, who is charged with delivery of methamphetamine, delivery of cocaine and delivery of heroin. Miser is being held at the Marion County Correctional Facility with bail set at $1.5 million. Miser worked at All-American Truck & SUV Accessory Centers on Portland Road Northeast, the site where one of the search warrants was served. Birr said Casey Miser is the son of an owner of the parent company. Birr said drugs were found at both the business and Miser’s home in the 1300 block of Rafael Avenue North. “It was one of the nicest homes we’ve ever executed a search warrant on,” Birr said. Jeff Kuhns, KPD deputy chief, said the home was not a source of complaints to the department. “The illegal possession and distribution of controlled substances can have many different faces. It can include those who have a lower economic status and lifestyle to those who have a much higher economic status and lifestyle. The spectrum can be very broad from those who use, distribute or possess grams or ounces of controlled substances to those who possess and distribute pounds,” Kuhns said. Given the large quantities of many different controlled substances, Birr placed Miser on the upper end of the spectrum of drug dealers. Birr was not able to offer insight into why Miser had the body armor, but said the bust was the largest in the area since the spring of 2016. The KPD Community Response Unit provided manpower to conduct surveillance and then execute the search warrants. While the arrest and seizure capped the investigation, it isn’t the first time Miser has had run-ins with law enforcement. In 2011, he was convicted of possession and delivery of marijuana, as well as first-degree theft. Miser served 16 months in prison as a result, according to court records.